The importance of water does not have to be emphasized. Everyone knows that we need it every day. Water is used for drinking, eating, washing, bathing, and many other tasks at home and at work. This is the reason why more and more people are securing their water source by getting a water well drilled on their property. By having their own reliable source of water, home and business owners can be sure that their water is always available when they need it. If you don’t want to rely on someone else for your water, here’s what you should look into. With this type or project, you will have to check with the local authorities of your home or business. There might be some existing zoning laws that you have to abide by. Certifications and permits will also be needed to make sure that the well does not violate any law or cause any harm to anyone, the environment, or anything in the area. Take note that this project will take a professional to implement a water well drilling plan. Things like the composition of the ground that you have to dig through, the depth of the water source, the type of equipment needed for the task, and many others factors need to be considered. After performing tests on the soil and properly assessing the ground, you will now be able to start with the drilling process. At some point during the drilling, you will hit the water source. When this happens, you have to test for the water pressure. Depending on the water pressure at the current depth, you may have to dig deeper. Note that the deeper you get, the water pressure will be increasing as well. Once you have established a good depth, you can then attach the water pump to the pipe and have free flowing water available for your use. As you can see, water well drilling isn’t a task just anyone can do. You need to have special equipment, the proper knowledge, and skill set for the job. And since this is no easy task, there’s also the safety of the people involved you have to consider. 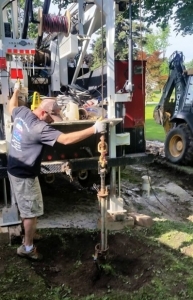 You’ll need the help of a professional well drilling company for St. Clair County. They can address everything listed above while making sure that the project is done in the most efficient and safest way possible. If you’re looking for a company with a proven track record, get in touch with Ries Well Drilling. Their specialists will be able to assist you in coming up with an efficient, cost-effective and high-quality water well drilling plan. Give them a call today to get a comprehensive estimate for your project.